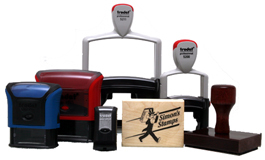 It's easy to order custom rubber stamps from simonstamp.com. Just click on CATALOG. 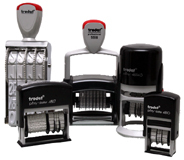 You'll see a variety of Rubber Stamps to choose from, including our traditional wood handle Rubber Stamps, art mount stamps, Trodat Printys, Xstampers, daters and more. 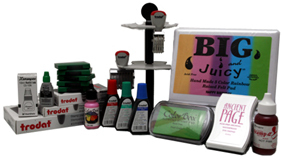 After you select the product, you can design your stamp on-line, selecting typefaces, sizes, and uploading your own graphics. You'll even get a chance to see your design on screen or email yourself a proof before placing your order. Because of our efficient systems and expert technicians, we can ship faster than anyone else. Stamps ordered by 12:00 noon (Eastern time, GMT-5) are shipped the same day (Monday -Friday.) Exceptions: Xstampers, Multi-Color, and RoyalMark stamps. They require an extra 24-48 hours. UPS Overnight Air service is available. Want to include a signature, logo, or favorite image? No problem! Our web site allows you to upload an image file when you order. For best results, save your work as a 500 dpi black and white TIF or BMP file. You can also send us images by US Mail, or by fax. Call us for special faxing instructions. Color Box Pigment ink pads in 64 rich, delicious colors. 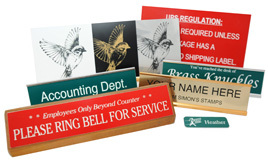 Our traditional wood handle stamps and art mount stamps are assembled by hand. Unlike some stamp manufacturers, who just keep a few stock sizes of pre-assembled handles, our stamp handles are custom cut to match the size of your rubber die. That way there are no excess margins to catch ink. That also means you get a clean, clear impression every time. Artists and crafters love our "art mount" stamps. These are genuine red rubber stamp dies mounted on beautiful clear finish maple blocks. They're custom made, with your graphic image or text (or both.) Minimum order: 1 stamp. Best of all, you'll love our service! We guarantee it. Since 1989 when we started, we've prided ourselves on providing faster and better service than anyone else. We use the latest technology and highly skilled craftspeople and proofreaders, to make sure your stamp is perfect. If you're not satisfied, you can return your stamp for a free replacement. We can quote on volume rubber stamp orders. If you need to place a large order, let us know. We have special arrangements for wholesale (dealer) customers, and for large volume orders. The quality and service are the same, but the price is reduced when we can produce for you more efficiently. To request a quote, please email or fax us at (413) 863-6804 or 1-(800) 870-7888 (USA and Canada.) You can also telephone us at 1-(413) 863-6800, or 1-(800) HE-SIMON. 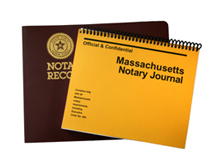 Our mailing address is: 320 Avenue A, Turners Falls, MA 01376-1826 USA. Real Estate agents and landlords give our products as gifts to tenants and clients. Product managers give them to stores as frequent buyer promotions. Trade shows give them to exhibitors for stamping attendee cards. Smart people use them to advertise their website or email address. We see surprising new ideas every day. We can help you with distribution as well as production. 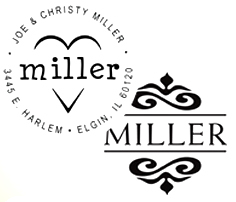 Our staff can ship your custom products for you to one (or many) addresses, using your return address label if you wish. Free shipping to USA and Canada !